October’s NASA Extreme Environment Mission Operations (NEEMO) mission, based at the Aquarius underwater habitat in Key Largo, Florida, is set to begin this week – weather permitting. The 13 day mission will conduct an underwater simulation of protocols which may become part of a crewed mission to a Near Earth Object (NEO). The mission was set to begin on October 17. However, poor weather in the region delayed “splashdown” to NET (No Earlier Than) Thursday, with the teammembers currently under a tornado watch. The team have still been working through their pre-mission “training week”, taking advantage of all the assets now at the location. NASA astronaut and former International Space Station (ISS) crew member Shannon Walker will lead the 15th expedition. The Crew includes Japan Aerospace Exploration Agency astronaut Takuya Onishi and Canadian Space Agency astronaut David Saint-Jacques from the 2009 NASA astronaut class. Steven Squyres of Cornell University and scientific principal investigator for the Mars Exploration Rover Project, will join James Talacek and Nate Bender of the University of North Carolina, Wilmington – who are both professional aquanauts. NASA astronauts Stan Love, Richard Arnold and Mike Gernhardt, all veteran spacewalkers, will participate in the NEEMO mission from the DeepWorker submersible, which they will pilot. 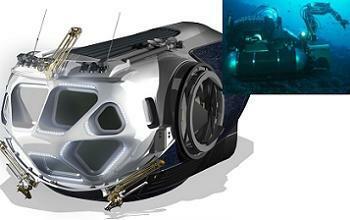 The DeepWorker is a small submarine used as an underwater stand-in for the Multi Mission Space Exploration Vehicle (MMSEV), which is currently the leading concept to be the main NEO exploration vehicle on site at the asteroid, utilizing its robotic arms and crew airlock. These submarines arrived at the Key Largo local via the Liberty Star, one of the ships which was tasked with recovering the Solid Rocket Boosters (SRBs) from the Atlantic after a shuttle launch. All elements of the underwater mission will mirror what is currently planned for a deep space mission, involving the Space Launch System (SLS) superior lift capability to loft any of all of the hardware into orbit, the Orion (MPCV) crew vehicle (x2), the MMSEV, and a Deep Space Hab (DSH). 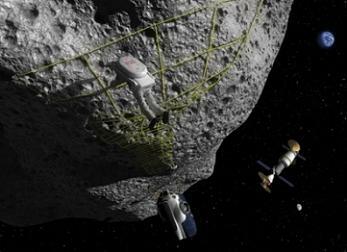 The DSH is a required element of the mission, as the crew will expect – at least via the “Flexible Path” NEO mission examples – to spend half a year in space, of which around 14 days will be spent conducting the mission goals at the asteroid. With NASA’s Mission Operations Directorate (MOD) involved in simulating their role of “Plan, Train, Fly” (PTF) – which starts with mission outline planning, right through to working the mission proper – a graphical representation of the deep space mission was made available via their outline presentations (L2). Mission scenarios are portrayed in graphics showing a spacewalker using a grid of “excursion lines”, accompanied by the MMSEV, whilst an Orion loiters in close proximity, itself attached to a DSH module and a second Orion. NEEMO 15 will work on three major elements of a NEO mission, such as how to anchor to the surface via the “excursion lines”; how to move around; and how best to collect data. This will allow for the evaluation of different anchoring methods and how to connect the multiple anchors to form pathways. The aquanauts and engineers will evaluate different strategies for deploying instruments and moving along a surface without gravity. 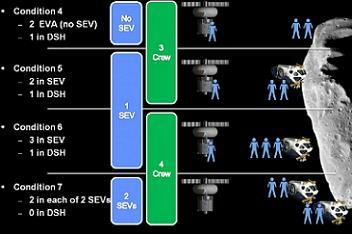 Per MOD documentation, four asteroid mission scenarios are being studied at a planning level, listed as Condition 4 through 7, opening with three crewmembers heading out into deep space – one remaining in the Deep Space Hab (DSH), while the remaining two conduct an EVA on the NEO, prior to moving up to the involvement of a MMSEV hosting the two crewmembers excursion to the asteroid’s surface. While the underwater environment provides the nearest training scenario possible – with deep coral reefs 19 meters below the surface – enforced simulation scenarios will include the expected delay in real-time communications between the crew in deep space and Mission Control. NEEMO’s mission includes a remote Mission Control Centers (MCC) – established both in Key Largo and building 30 room 211 at the Johnson Space Center (JSC) – which will exercise time delay communication protocols, along with advanced planning and timeline development tools. 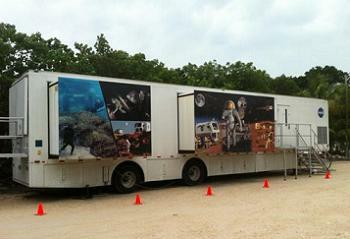 The remote MCC is the same equipment trailer as that being used for NASA’s Desert Research and Technology Studies (DRATS) and the international Pavilion Lake Research Project (PLRP) simulations, which are also focused on NEO training, along with Mars surface missions. “NEEMO 15 will require complex choreography between the submarines and aquanauts living and working in their undersea home,” said Bill Todd, NEEMO project manager. While SLS and Orion mission architecture remains under design at the Johnson Space Center (JSC) – which may now include more of an initial interest in the Moon – NASA’s overall plan continues to note a mid 2020s mission to a NEO, which would provide deep space evaluation of the hardware ahead of an eventual mission to Mars or one of its moons – such as Phobos. 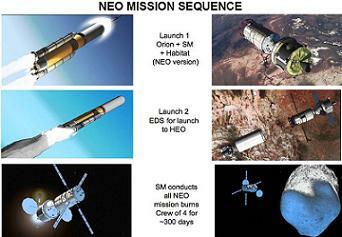 The NEO mission will involve humans travelling further into space than ever before.